DANSVILLE, NY (2009) Here's a sampling of the hectic prep-work at Dansville's Festival of Balloons (NYSFB at Dansville). More pics to come, later in the week. Team USA takes the foreground. At least eight others warm up for launch. Primary colors crowd out the tulip balloon. The rest struggle to catch up. "Fire in the hole!" It takes a big burn and lots of helping hands to get these monsters aloft. No less than 40 hot air balloons launched on a spectacular Sunday evening at Dansville. For once, the weather cooperated for the entire Labor Day Weekend 2009. More pics to follow. All photos copyright 2009 - reprints available on request. Great games for family camping: KanJam! 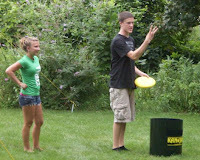 KanJam is fun for kids and adults alike, easy to set-up and learn -- the hit game of the summer! The KanJam disc is upper right corner, headed for a SCORE! Once every decade or so, someone brings out a game with enough universal appeal to guarantee it will sweep the market. This summer, KanJam has won fans from campgrounds to parks and beaches to graduation parties. KanJam is a hit because it's inexpensive, easily portable, sets up in seconds, and appeals to a broad range of ages and skill-levels. Oh yeah, it's FUN, too -- that never hurts. You know how kids tend to "invent" games with whatever is at hand. Kan-Jam is the result of two imaginative players named Charles Sciandra and Mitch Rubin plus one Frisbee and two trash cans. Imagine the fun they had whacking that plastic disc off a pair of metal trash bins set out as goals. "Hey, this would be a great party game!" they must have imagined. "But how could we market a game that needs two trash cans?" might have been the skeptical response. KanJam action continues - 3 points! If you can throw a Frisbee ("flying disc," if you insist), you're in. We recently held a backyard tournament in which the players ranged in age from 15 to 80, and in skill-level from 'barely able' to 'very good.' We had a blast. 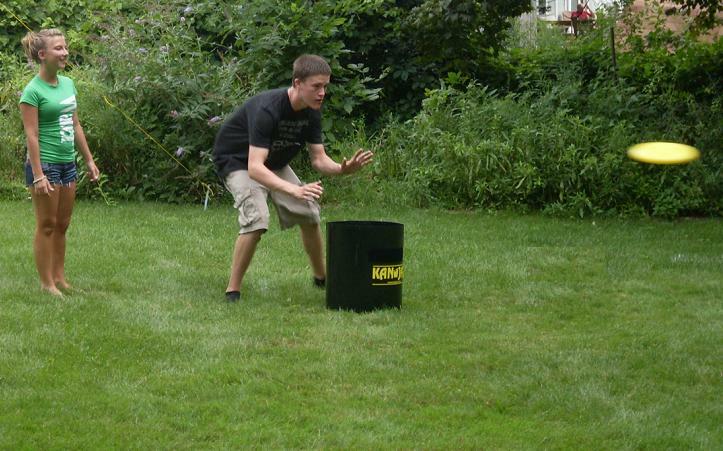 The distance between Kan-Jam's goals can always be adjusted to suit the contestants' abilities. Four players. Two teams of two, with a member of each team behind each goal. Player One sails the disc toward the opposite goal, where his/her partner stands ready. Player Two (the partner) may "help" the disc hit or drop into the Kan for various points. Next, Player Two tries to score by throwing the disc back toward his/her teammate. Players Three and Four (the other team) repeat the sequence. Play alternates between teams, until one team reaches 21 points. "Sudden Death" may result if the opposing team is only one point behind at 21. "Dinger" - the disc is redirected to strike the side of the goal. One Point. "Bucket" - the receiving partner slam-dunks the tossed disc directly into the Kan. Three Points. "KanJam" - Instant Win is scored if the throwing player's disc goes through the slot and into the Kan. Variation: Four Points for sailing the disc directly into the Kan, unassisted. Sometimes we have trouble finding a willing fourth player, and we have to make do with just three. In that case, two players occupy one end as opponents. The third contestant covers the opposite goal, alone, and acts as a member of both teams. By playing a series of games and alternating which person is in-goal alone, this four-player game can still be fun for three. We prefer games that aren't too expensive, are easy to pack-up and transport, aren't ruined by sudden downpours, and can be enjoyed by a wide variety of participants. KanJam wins on every point. It's fun and entertaining, even for spectators; and works well as a "tournament" game to keep the whole gang occupied for an afternoon. It's also one of those rare outdoor games you can play in the rain, important because it always rains when we're camping! KanJam is a trademark of KanJam, LLC and is available from retailers in all 50 states and Canada. Find it online at KanJam.com and other web-based sites. Price is approximately $40 plus tax. 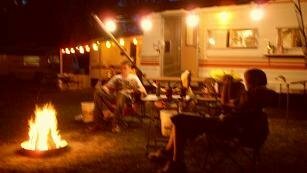 If you've found a great camping game and would like to share your review, please let us know. 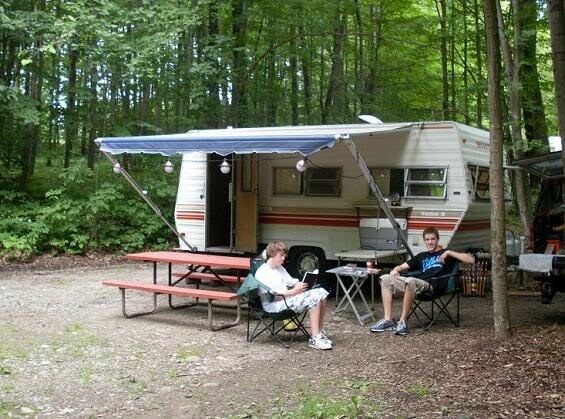 Towing a travel trailer: A brief encounter and a "what if?" Why, oh why, do moronic drivers pull out or turn left directly in front of me on the road?? Please tell me. Saturday, on the way to our reunion picnic, some idiotic woman made a sudden left turn from the oncoming lane directly in front of my 55-mph-moving bumper. I feathered the brakes and hammered the horn. I actually saw her brace for the impact! Had I been moving a bit faster, or paying as little attention as she was, my SIX THOUSAND POUND truck would have plowed into her passenger-side door, perhaps all the way into her seat -- most likely fatal for her. We'd have suffered bruises from our seat belts and the air bags, and the truck would have been totalled. But she would probably have been dead. Why? Was she on the phone? Texting? Doing her make-up? Daydreaming? I drive a big truck, with bright white daytime running lights blazing. I'm careful, perhaps a bit compulsive about defensive driving (with good reason? ), and rarely exceed the speed limit. When I'm pulling my 4000# camper (for a total of five tons, if you're mathematically-inclined), I'm downright paranoid. Will the day come when I'm a half-second too slow on the brakes? When I just happen to be distracted for the slightest moment? When someone really DOES cut it just too damned close? If I had been pulling the camper on Saturday, there's no way in hell I could have avoided hitting that woman who turned in my path. That would have ruined my vacation, and probably the rest of her life (or ended it). I pray it never happens that way. Does this only happen to me? Somehow I doubt it. Does it happen to you? Have you ever had an unfortunate on-the-road incident during a camping trip? What happened? Was your vacation ruined? The Lug_Nut RV Trivia Challenge No 13 will test your on-the-road knowledge . I love Challenges! Sometimes pulling my old Shasta camper is a challenge. I've added tips for towing safety on the road in this recent post. Leave a Comment here if you took the Challenge, above. Thanks!